I was waiting for this review after you mentioned it while I discussed my troubles with Grendel! Honestly, it’s nice to know I’m not the only one who has struggled with a book lately. It’s just really frustrating to feel like you’re not getting it, no matter how beautiful the writing is or how much you want to love it. It makes it that much harder when you go to rate it too, because really, what rating accurately reflects “I don’t know”?! I don’t think I’ll read this one, but that’s partially because I haven’t really read any of his other work either besides The Lion, the Witch, and the Wardrobe. I’d pry read the read of his series first before trying some of his other work! It made me feel good to review your review of Grendell as well for the same reasons! I meant to ask a friend of mine who’s a big Lewis fan his thoughts on the book when I saw him last week but forgot. Hopefully I’ll remember some other time and maybe he can shed some light for me! Yet at the same time, I want to really understand it myself! I have books like this left over, unfinished from my studying days. I should really work out a schedule to begin reading through them all! Great review. Unfinished books are so hard to get back to! I think it is so difficult to review classic books sometimes, because obviously they have a lot of merit, but if you personally didn’t like them, it doesn’t seem fair to give it a bad rating, but it’s too difficult to give it a good one! But I think you gave it the right rating. I’ve never read this book, and am not sure I’ll feel up to deciphering it, but I am intrigued by the fact that C.S. Lewis started it when he was atheist and finished it as a Christian. I wonder if it changed the direction he took the story. Thanks! It was difficult as I did like this book, but I didn’t love it or get as much out of it as I was expecting to based on what I know others (whose opinion I respect and generally align with) felt about it. 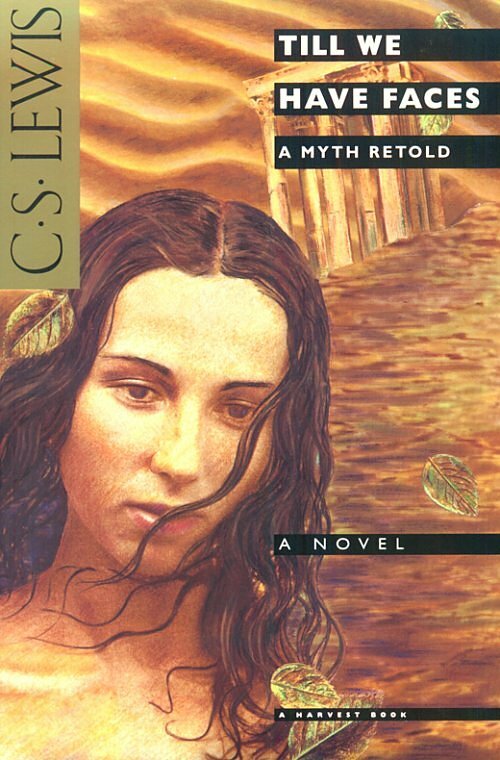 I love mythology, and had no idea C.S. Lewis had written a book like this. I guess that’s not too surprising since I haven’t actually read anything of his other than the first Narnia Chronicles, back when I was a wee reader with fake plastic glasses. I’m sure had I kept on with the series I would have eventually explored further into his body of work, but the credit definitely goes to you to introducing me to this book. You’ve got me wondering if a knowledge of the story of Cupid and Psyche could produce more enjoyment out of reading this book. Putting it on my TBR list to find out. There was a little short explanation of the original myth at the back of the book, but yes, I think if you have more knowledge prior to reading that could help the enjoyment factor. I love mythology a lot and I actually don’t know anything about C.S. Lewis’ work beyond the Narina chronicles. I don’t mind checking out this book at some point. Although I feel like his writing style is very similar to Tolkien’s writing style kind of. So it might take a little bit of time to get used too. I hadn’t actually heard of this book until I saw your review, so thank you for introducing it to me :). Lewis and Tolkien were good friends and colleagues so they probably did write similarly (it’s been a while since I’ve read any Tollien). This is a lesser-known work of Lewis’; if you read it I’ll be interested in hearing what you thought!